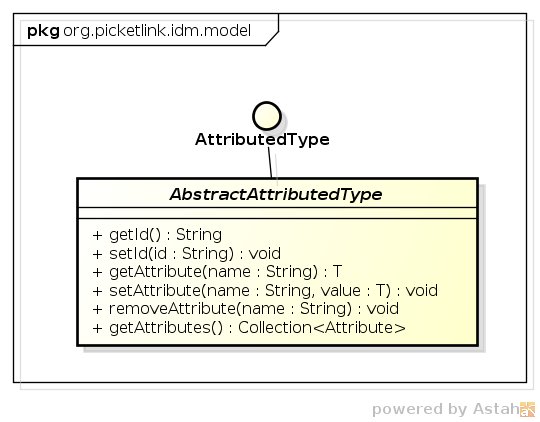 The add() method is used to create a new relationship. The update() method is used to update an existing relationship. Please note that the identities that participate in a relationship cannot be updated themselves, however the attribute values of the relationship can be updated. If you absolutely need to modify the identities of a relationship, then delete the relationship and create it again. The remove() method is used to remove an existing relationship. The createRelationshipQuery() method is used to perform relationship queries. The inheritsPrivileges() method is used to check whether an identity inherits privileges from another. To search for existing relationships between identity objects, use the Relationship Query API described later in this chapter. What this means in practical terms, is that every single relationship is assigned and can be identified by, a unique identifier value. Also, arbitrary attribute values may be set for all relationship types, which is useful if you require additional metadata or any other type of information to be stored with a relationship. 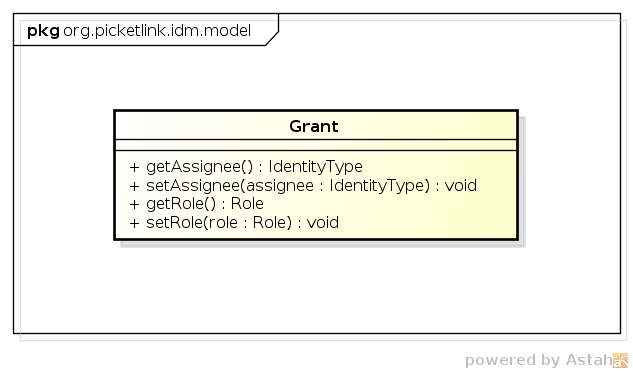 Application roles are represented by the Grant relationship, which is used to assign application-wide privileges to a User or Agent. The GroupMembership and GroupRole relationships are used to represent a user's membership within a Group, and a user's role for a group, respectively. While the GroupRole relationship type extends GroupMembership, it does not mean that a member of a GroupRole automatically receives GroupMembership membership also - these are two distinct relationship types with different semantics. A Group is typically used to form logical collections of users. Within an organisation, groups are often used to mirror the organisation's structure. For example, a corporate structure might consist of a sales department, administration, management, etc. 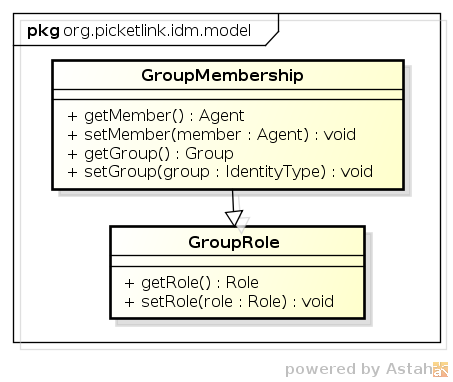 This structure can be modelled in PicketLink by creating corresponding groups such as sales, administration, and so forth. Users (who would represent the employees in a corporate structure) may then be assigned group memberships corresponding to their place within the company's organisational structure. For example, an employee who works in the sales department may be assigned to the sales group. Specific application privileges can then be blanket assigned to the sales group, and anyone who is a member of the group is free to access the application's features that require those privileges. The GroupRole relationship type should be used when it is intended for an identity to perform a specific role for a group, but not be an actual member of the group itself. For example, an administrator of a group of doctors may not be a doctor themselves, but have an administrative role to perform for that group. If the intent is for an individual identity to both be a member of a group and have an assigned role in that group also, then the identity should have both GroupRole and GroupMembership relationships for that group. The second parameter of the Group() constructor is used to specify the group's parent group. This allows us to create a hierarchical group structure, which can be used to mirror either a simple or complex personnel structure of an organisation. Let's now take a look at how we assign users to these groups. A User may also be a member of more than one Group; there are no built-in limitations on the number of groups that a User may be a member of.